I love getting letters in the post because they’ve become such a rarity. Especially if the address is written by hand and there’s postage stamps stuck on the envelope. Unfortunately handwritten ‘letters’ bearing news and affection from far-off friends and family have become almost extinct. We don’t even take the time to write emails these days with chat, facebook and skype at our constant disposal. I got two letters this week. And not surprisingly, neither is a ‘real’ letter from friends or family. One is an invitation to an art exhibition. The other, printed on an Inland Letter Card, is a notice reminding me to renew a magazine subscription. Even though they’re not the real thing, I still enjoyed receiving them because they seem to me like mementoes of a time past. Of course each respective sender could have sent me an email, inviting me to the exhibition or reminding me about the subscription renewal. But they didn’t. They sent me a letter instead. I like receiving letters because they’re almost obsolete. I kept these two letters on my desk all week and once in a while I’d look at them. I used to love writing and receiving letters. I’d choose nice envelopes, carefully write the address in my best handwriting and then ask for ‘nice’ stamps at the post office. For me, letter writing was a high art and the paper, envelope, colour of ink, stamps and postmarks were all part of the tableau. At my first job after university one of my tasks was to open all the mail in the morning. I loved this task. In those days, most communication was still done by post and we would get a mountain of mail every day from every corner of the world. I would examine each envelope and carefully cut away the stamps for my co-worker who would later give them to her daughter. I used to even joke that my ideal job would be mail carrier. 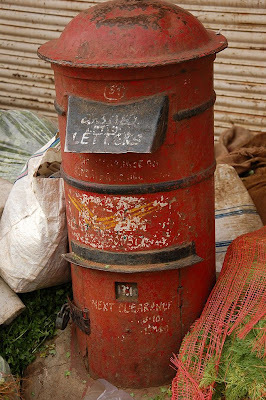 I would get to get up early, sort and handle exquisite letters with beautiful handwriting and exotic stamps, spend most of the morning walking around residential neighbourhoods, distributing good news to happy housewives and then go home to retire by midday. The life of a mail carrier is probably not as romantic as I imagined. Besides, the only mail delivered today is mostly computer-generated bills – and a few invitations and subscription reminders. This post was supposed to be about my experiences with India Post but it has taken an entirely different turn. That will have to be the subject of a future post! 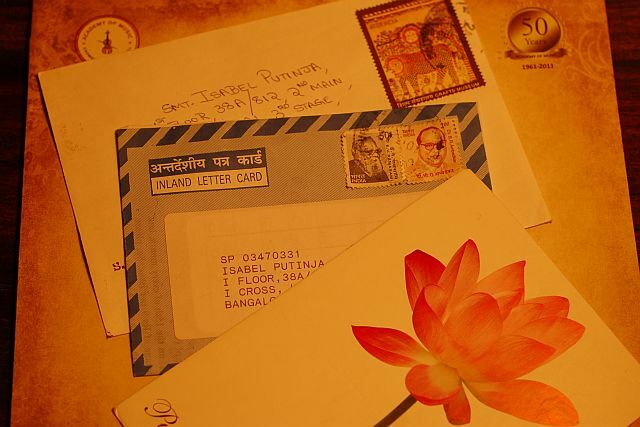 Oh!I share the same thoughts.Love receiving letters.As a kid,my grandpa and I used to sit every noon near our gate waiting for the "postamma". I still have all the letters I have recd from my family from Mysore and Kolar.Even within Blore,we wrote letters to each other.The last I recd a handwritten letter was from my cousin just after I went to US in 1997.By the time the letter reached me,the news would have become stale.And slowly we moved on to the brand new form of communication;email.. I'm glad to see there are other people who also love writing and receiving letters!